One of my Christmas gifts was a copy of Plenty, by Yotam Ottolenghi. Ottolenghi is a celebrity restaurateur in London and he also writes a weekly column for The Guardian newspaper. I was thrilled to receive his book of innovative vegetable dishes. 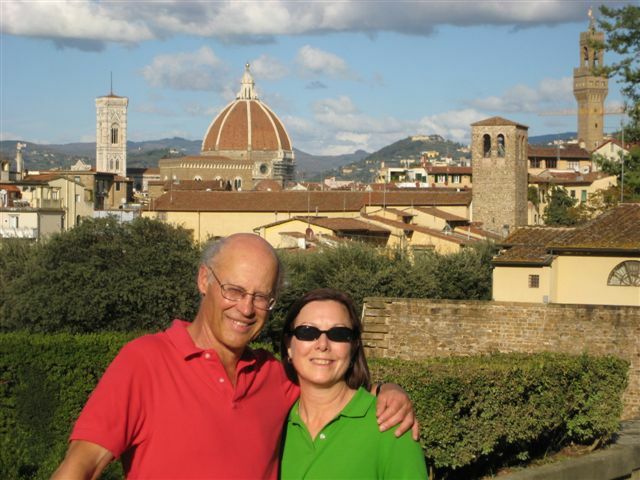 They are substantial enough to make great vegetarian meals and they also make stunning side dishes when served with simple grilled or roasted meats. When it came time to choose a recipe to take to a New Year’s Day party, I selected Ottolenghi’s Green Lentils, Asparagus and Watercress salad. I could just tell by reading the list of ingredients that it would be a great recipe. I pretty much followed the recipe, although I found my green lentils (also known as French or puy lentils) took a lot longer than his 15 minutes to cook. 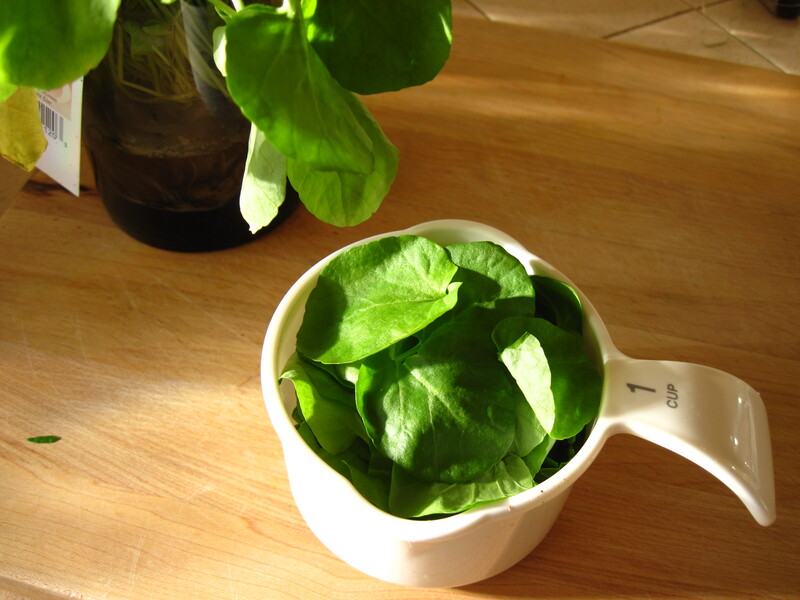 The dressing is almost like a watercress pesto. I wondered if the 1 tablespoon of red wine vinegar would be enough, but everything came together beautifully. 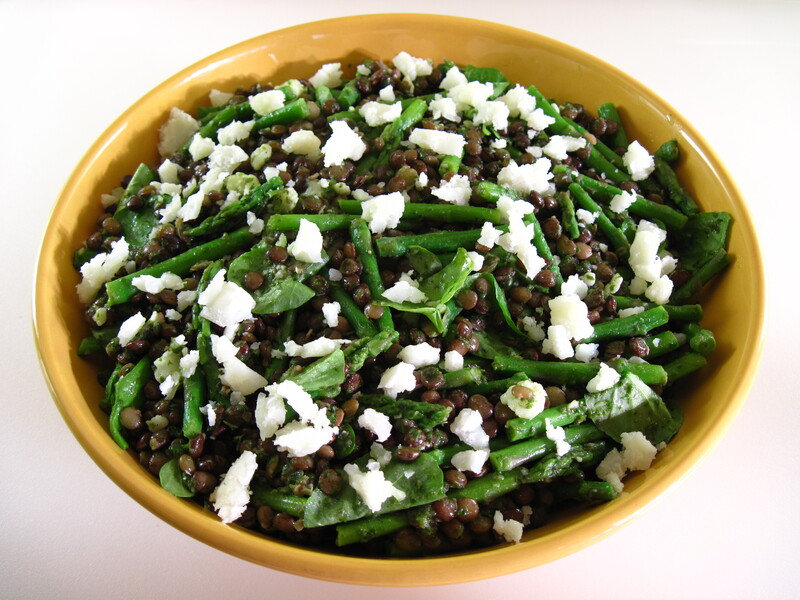 The Green Lentils, Asparagus and Watercress salad was very well-received at the party! It’s definitely one I would make again, especially when we have fresh local asparagus available this spring. Serves 4 generously as a vegetarian main dish, or 6 – 8 as a side dish. 1. Put the lentils in a pot. Cover with water, bring to a boil, cover and simmer for 25 – 30 minutes, or until the lentils are just cooked. 2. 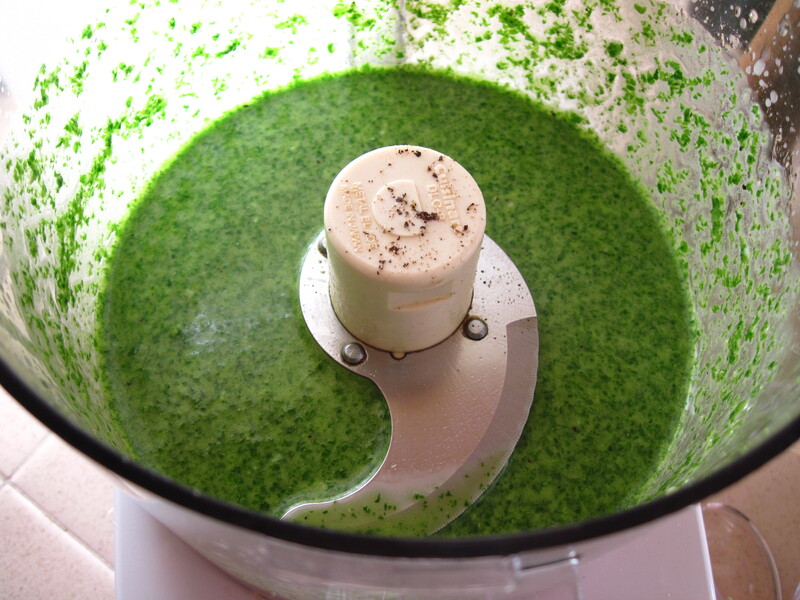 Put 2 cups of the watercress, the parsley, olive oil, vinegar, garlic, and a bit of salt and pepper in a food processor. Process until it is smooth. Pour the dressing into a large bowl. 3. When the lentils are cooked, drain them and stir the warm lentils into the dressing. Taste and adjust for seasoning, adding more salt and/or pepper if necessary. 4. Wash the asparagus and trim the tough ends off. Cut the spears into 2 – 2½-inch lengths. 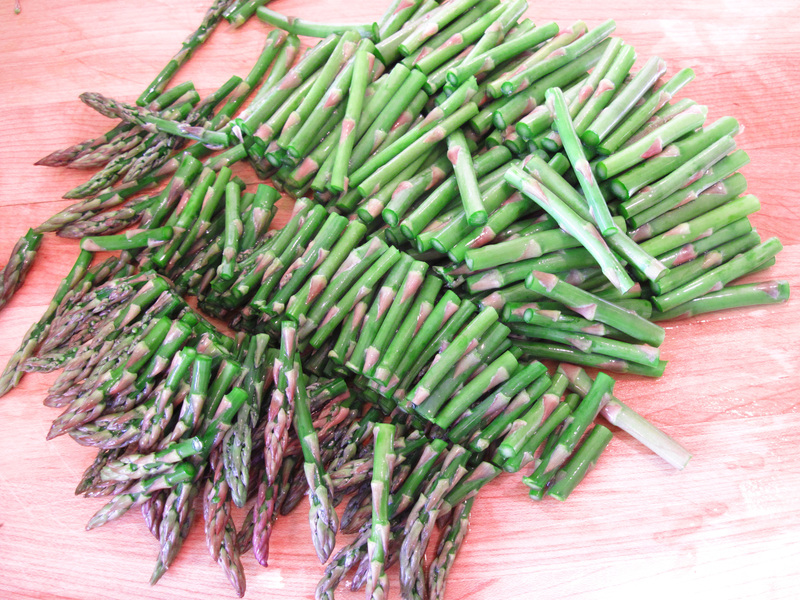 Bring a pot of water to boil, add the asparagus and cook for 2 minutes. Drain and add to the bowl of lentils. 5. 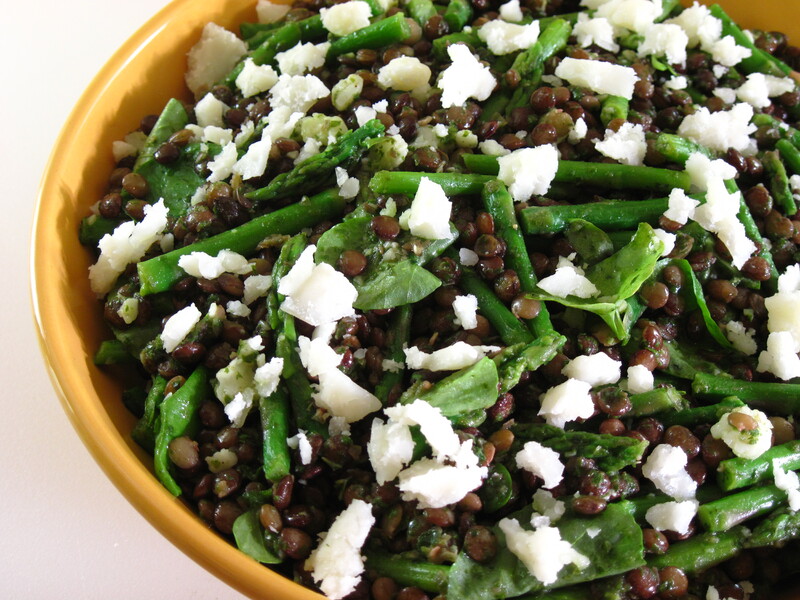 Toss together the lentils, asparagus, the remaining 2 cups of watercress, and some of the crumbled cheese. Garnish with the rest of the cheese. 6. Optional: At serving time drizzle with some walnut oil and serve with lemon wedges. I think I need that book! Looks so good. 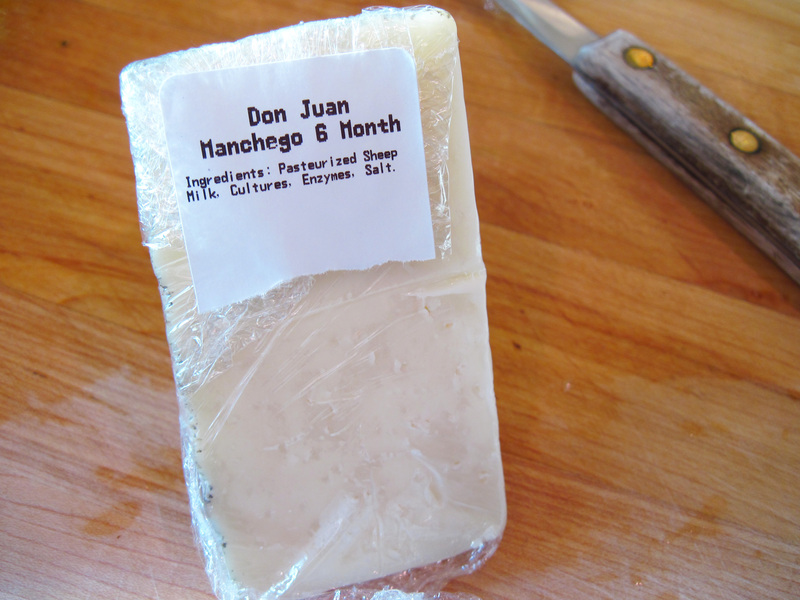 You had me at Manchego. Thanks, Dawn! The book really does have a lot of interesting recipes! I pinned this. Everything I have made by Ottolenghi has been delicious. I can’t wait to try this now that it is asparagus season. I’m sure you’ll love this one! Thanks for your comment. What a lovely recipe! This sounds like the perfect accompaniment for a piece of salmon.